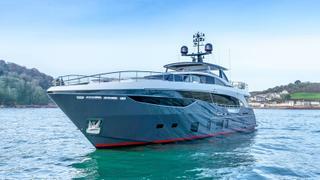 The new 35 metre motor yacht Samba has been listed for sale by David Westwood at Thompson, Westwood & White. Built in GRP to RINA class by British yard Princess with naval architecture by Bernard Olesinsky, Samba is now ready for delivery, offering a two-year builder’s warranty. An interior with satin-finished walnut wood panelling has accommodation for up to 12 guests in five cabins consisting of a master suite, two doubles and two twins convertible to doubles. All guest cabins have entertainment centres, LED television screens and en suite bathroom facilities while the crew quarters sleep five staff aboard this yacht for sale. The saloon has settees and armchairs arranged in a U-shaped configuration around a large coffee table and an entertainment centre including a large LED television screen and a stereo surround sound system. A special feature here is a pair of glass sliding doors to starboard leading out to a sea balcony. Forward is a formal dining area with seating for eight guests and storage for glassware, china and silver. The aft main deck has comfortable built in upholstered bench seating and three occasional chairs, a table and a full wet bar, making this the perfect location for al fresco entertaining and dining. Upstairs, the flybridge comes with U-shaped upholstered seating, a wet bar, a Jacuzzi tub and sun loungers, with a GRP hard top forward offering protection from the sun. Her top speed is 23 knots and her power comes from two 2,637hp MTU 16V2000M94 diesel engines. Lying in Plymouth, England, Samba is asking €15,500,000.